When you look at the picture above, I believe you might saying, "Omo! This is so cute!" or this picture attracted you well because of the colorful combination and the DISNEY FACE on the cushion. Maybe you're Ninja Turtle's team but who doesn't watch Disney when they're small? I have not considered a Disney fan but unless I do! Anyway, this is the limited edition Disney x THEFACESHOP Cushion Collection. THEFACESHOP had made the best decision on this collaboration coming out with 3 different types of cushions (1 BB cushion & 2 CC Cushions) with new formula as well. Each of them comes with one Disney character to representing the cushions. Below is the simple summary for your better understanding. BB Cushion, formulated according to the best seller BB Cream. 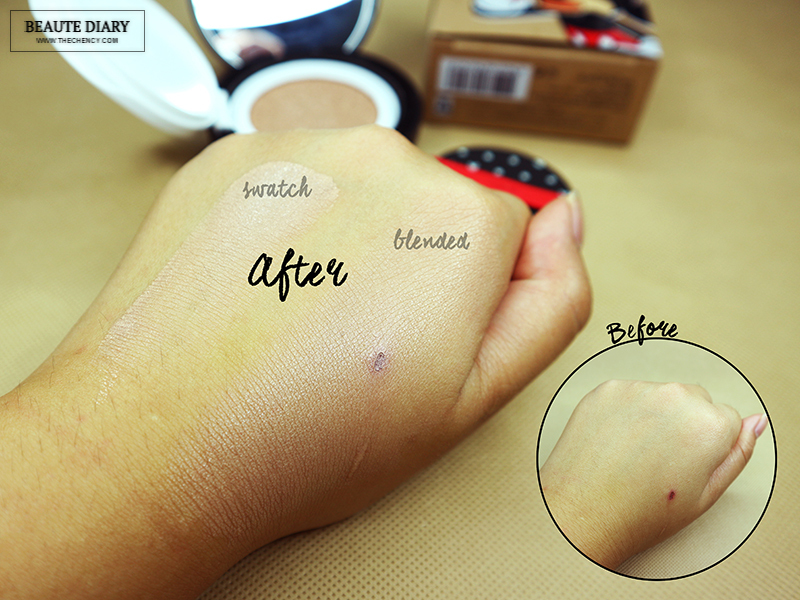 Helps to cover blemishes and brighten up skin tone. Suitable for all skin types. Giving a dewy & natural beautiful skin finish with a cooling sensation. Suitable for dry to combination skin. Has the highest coverage, helps to covers pores, smooth skins and provide a long lasting finish. Suitable for combination to oily skin types. 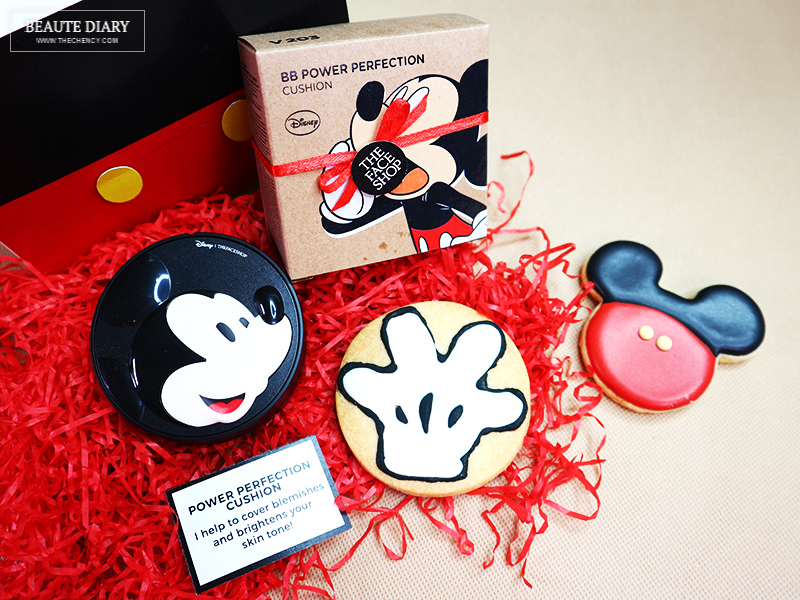 If you tried and love THEFACESHOP Power Perfection BB Cream, then you will like this Mickey Mouse BB Power Perfect Cushion as well. This BB Cushion is the compact version of that BB Cream but the formula is slightly different but better as THEFACESHOP already improved the formula. 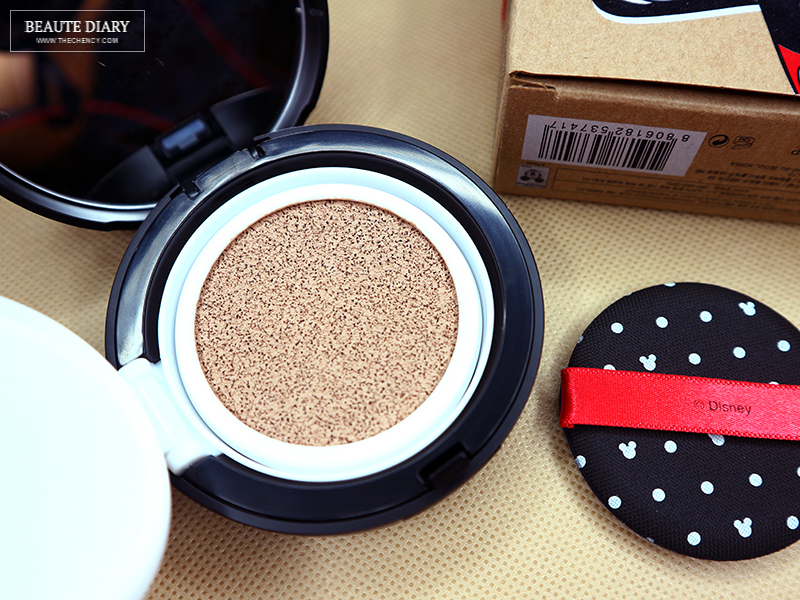 This BB Cushion has is a 3-in-1 function which is anti-wrinkle, whitening and sun protection (SPF 50 PA+++). It can help to maintain the skin's elasticity and firmness while moisturizing the skin for a supple and soft skin. This BB Cushion is available in 3 color shades; V103, V201, and V203 but this three shades give a grayish slightly pink undertone (just like the typical bb cream). I got mine in shade V203 which is the perfect match for my light skin tone. This BB Cream does oxidize a little but not the kind that makes your skin looks muddy and dull. So still recommend choosing the right shade with your skin tone or maybe you can choose a shade lighter if you want a brighter complexion. Coverage is about light to medium and what I like about this BB Cushion is does not create any dry patches on blemishes and the dry area which is a plus point for me (refer the pic above). It gives an in between of semi-matte and healthy glow finish and looking fresh. The only downside is the undertone is not really my like as I prefer yellow skin undertone. Overall, this is a great BB Cushion and suitable for all skin types especially blemishes skin (covers very well without drying). This chubby cheeks cushion is too cute! Like what's the name said, this is a CC Cushion. The highlight of this CC Cushion is the cooling sensation, fresh finish and contains a large amount of moisture cream ingredients like Hyaluronic Acid, Collagen, Flower essential oils, Snow Oil, Birch Tree and Flower Water that provide a long lasting moisturizing effect and dewy finish. The reason why this CC Cushion provides a cooling sensation is because of Snow Oil which will melts at the temperature of 30°C so the icy condition will remain until it touches with the skin. While the freshness was from the flower water like Damask Rose, Chamomile, Lotus Flower & Cornflower which will deliver instant freshness, moisturize, soothing and maintain skin's oil balance. 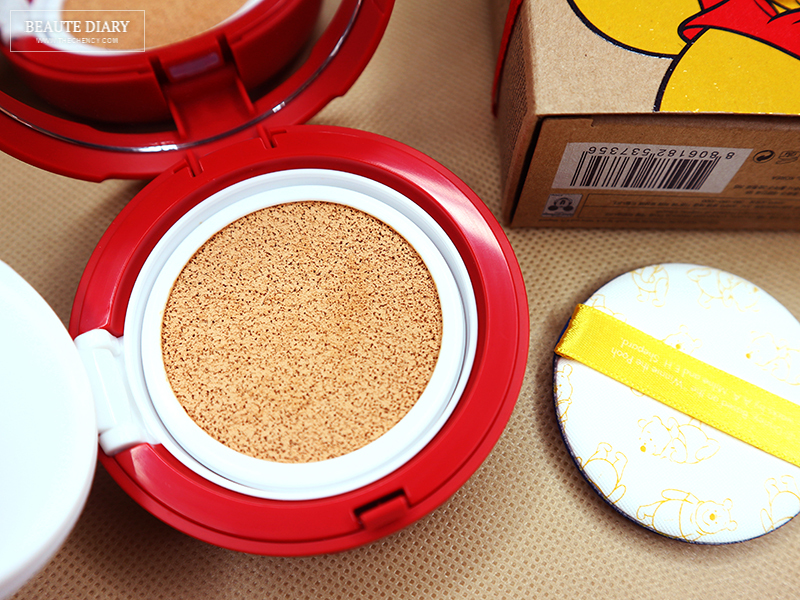 THEFACESHOP Winnie the Pooh CC Cushion is available in 2 shades, V201 and V203. It has nice natural apricot undertone which compliment on both pink and yellow skin undertone. Personally, I recommend this CC Cushion for dry to combination skin because this is a moisturizing cushion. It gives enough moisture which maintain the freshness of the skin without feeling heavy at all. 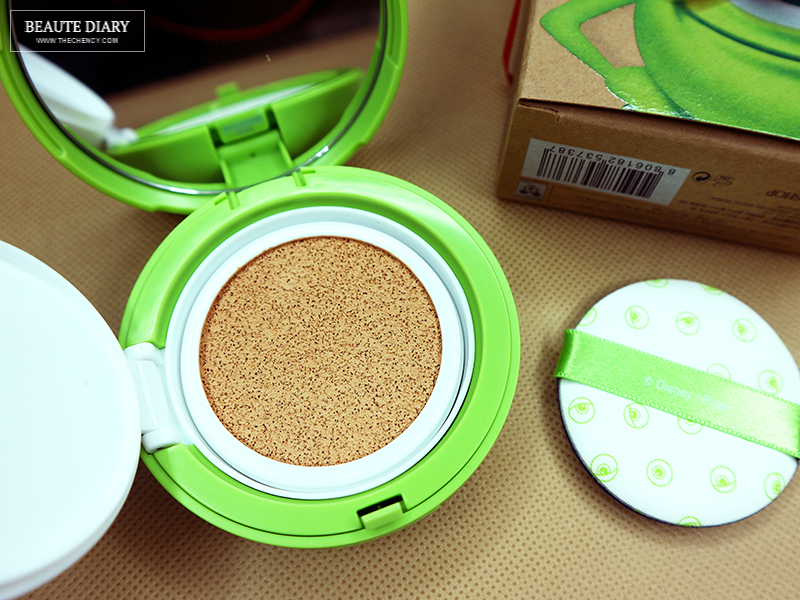 Besides than that, this CC Cushion also gives a beautiful glow on the skin and of course! a nice cooling sensation every time when applying without fail. Coverage wise is about medium-full and it's buildable. 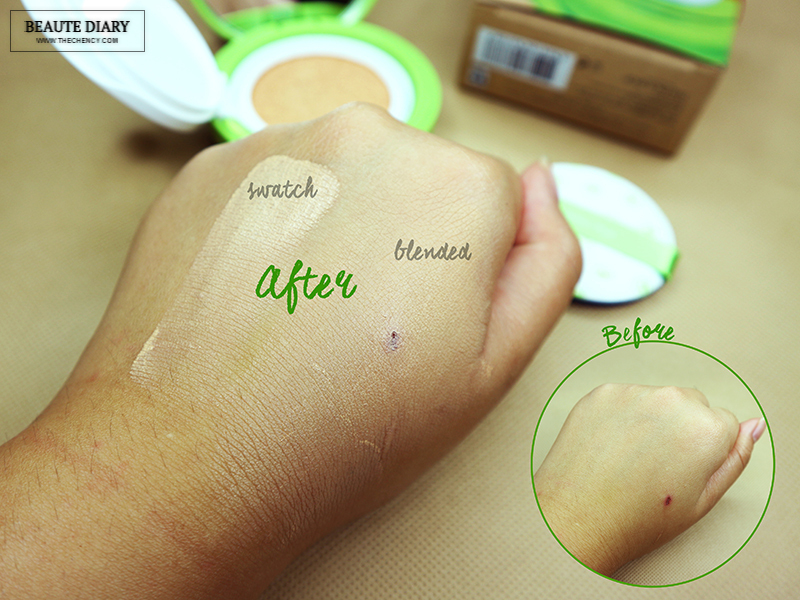 It is more like blurring more than like cover up which will gives you the most natural finish while also looking flawless at the same time. 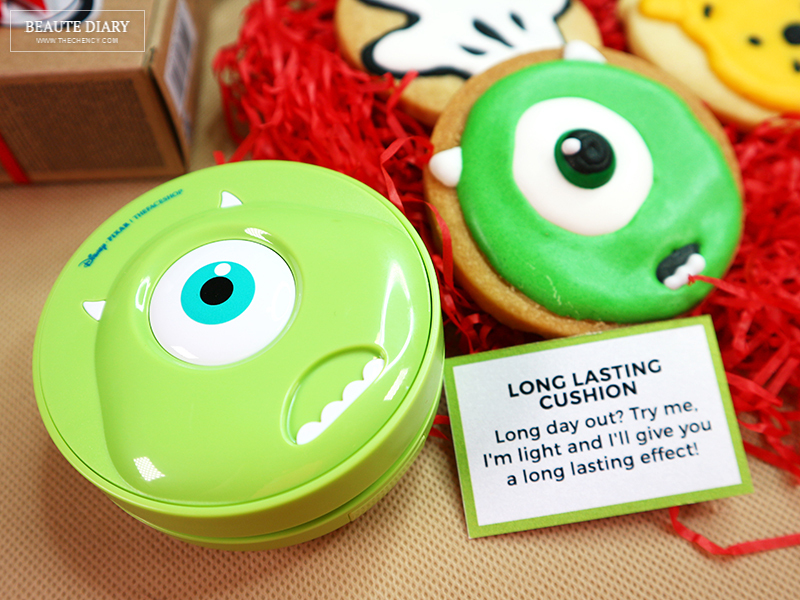 If you're looking for semi-matte finish, long lasting and fresh finish, then this THEFACESHOP Monsters Inc CC Long Lasting Cushion will suits you. This CC Cushion is perfect for summer and tropical country because it has Bio-saccharise gum-1 which will creates a moisture barrier on the surface of skin for moisturize, fresh and long lasting finish. The existent of the various sized spherical powders will also helps to fill in the pores for smooth and soft-focus effect while maintain the oil-balance of the skin. The skin-fitting system technology creates ultra adhesive film that enables the makeup to stay all day long. 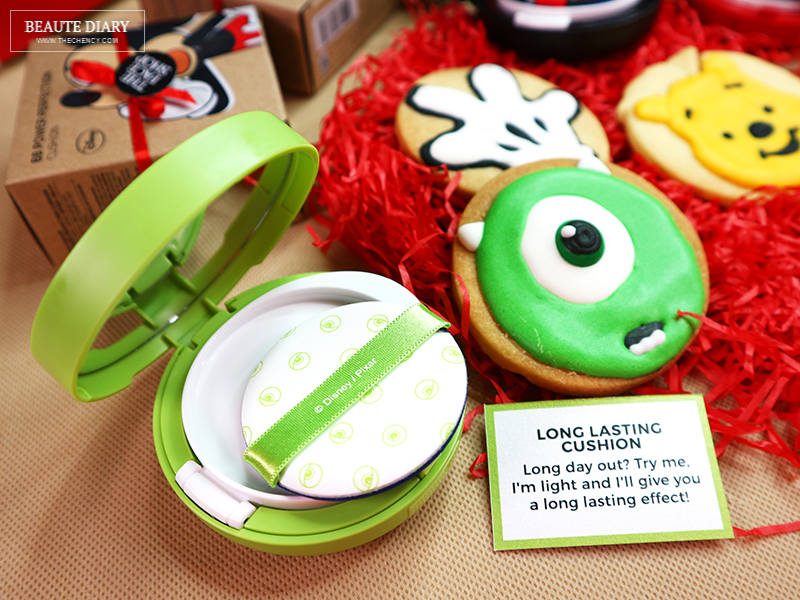 THEFACESHOP Monsters Inc Long Lashion Cushion in SPF50 PA+++ is one of my favorites cushion other than THEFACESHOP Oil Control Cushion. Personally I am more into control sebum cushion although I am combination skin's girl. This is because I live in tropical country, Malaysia so my skin tends to get oily (T-zone) easier. Sumore this CC Cushion also provides a fresh, light-weight and long-lasting finish which are also the keys when I'm choosing my base. This CC Cushion comes with 2 shades, V201 and V203 with a natural apricot skin undertone just like Winnie the Pooh version. Coverage wise is about medium coverage and it's buildable. It gives a soft-focus finish without looking too flat on your skin. 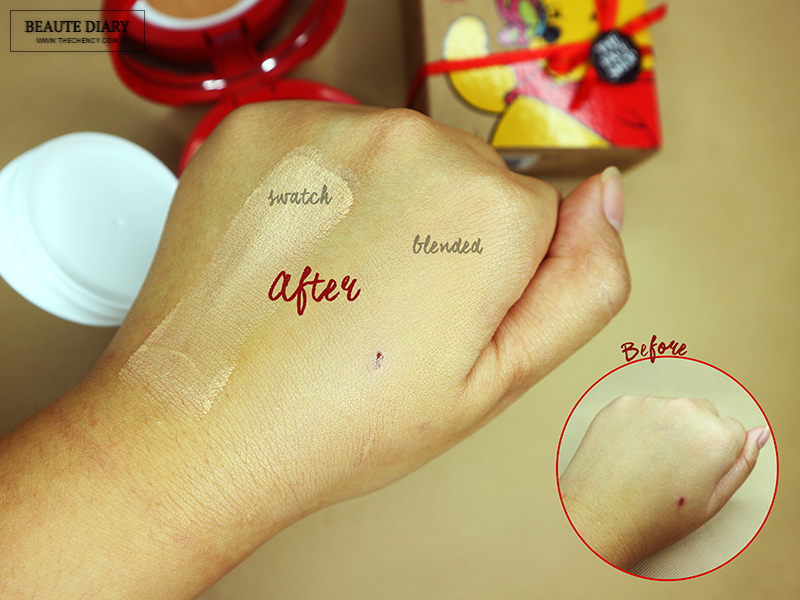 It is not sticky or tacky and it's set pretty fast without patchy after applying. It does creates dry patches on blemishes scars and dry area but will be solve by moisturize well the skin. Recommend to combination to oily skin types. 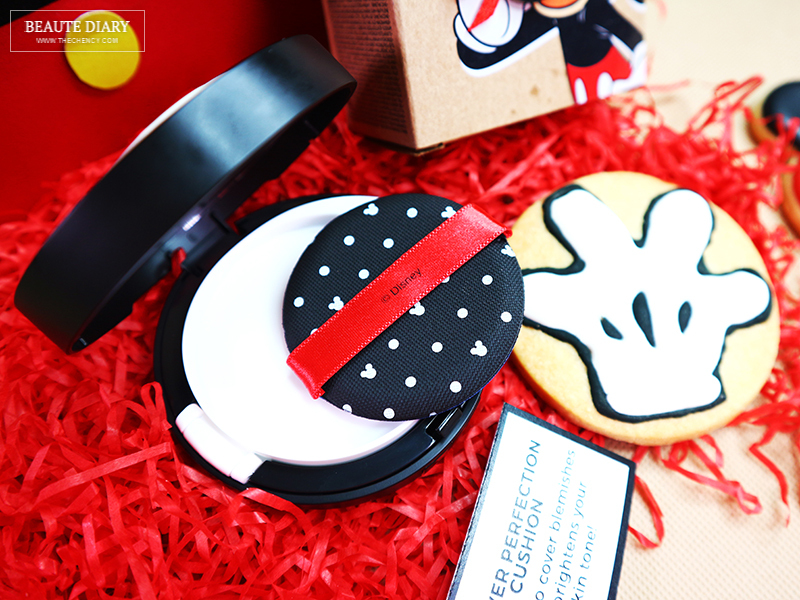 So which one is your favorite Disney X THEFACESHOP Cushion? So kawaii! I would love to have this collection. OMG! 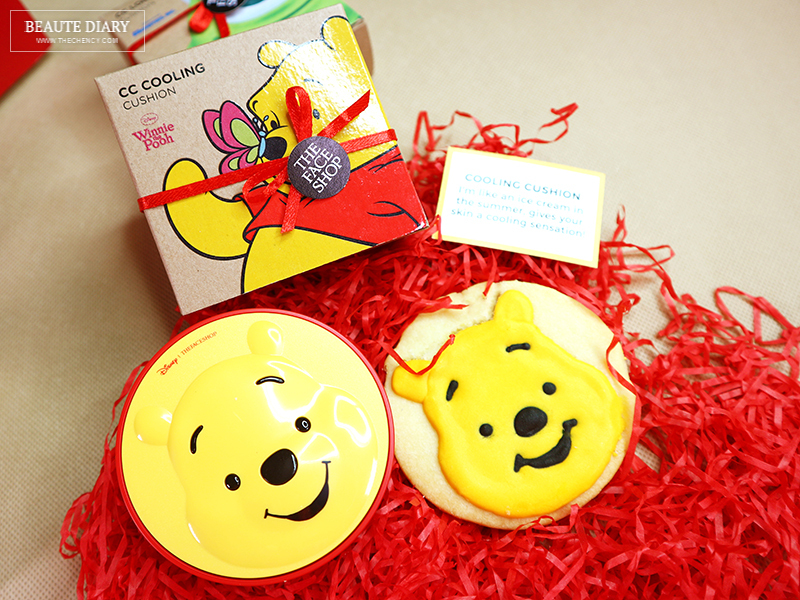 Winnie the pooh and Mike are so adorable! Omg I NEED the Mickey one! 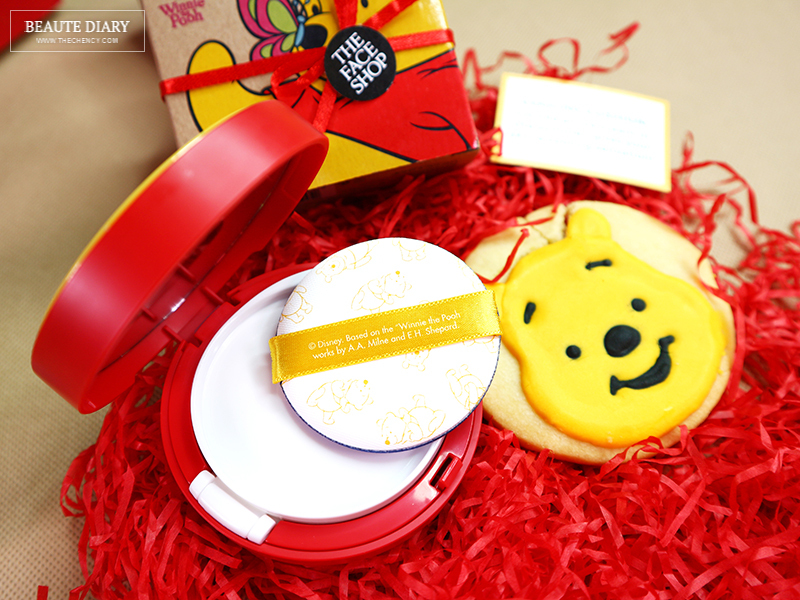 The packaging is too cuuuuute!! I'm not a fanatical Disney fan myself but this range is certainly cute. I particularly like Mickey Mouse and Monster Inc. Would really like to collect them! OMG! So cute! I love the monster packaging a lot!! I think I need them all!!! 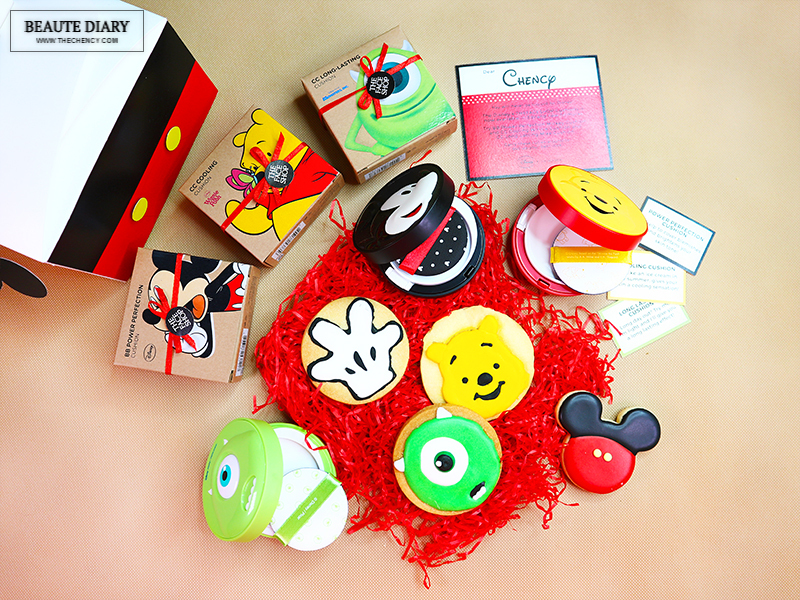 My Favourite is Mickey but seriously I think I have to check them out soon! LoL I thought those are decorations or pins, when I read the post, it is more than that. The designs are nice it is not the common plain black from Nichido or something I am a Nichido user, hope we have these kind, so it could be more fun! Mh my goodness they looks soo kawaii, and looks like macaroons! I love The Faceshop brands coz its also afforable and compliments my skintone. The pack has been designed and presented well. Oh wow, Winnie the pooh? I must get this. Really cute collections.